The distinction began during the middle ages when students often donned garb similar to the clergy. These long black gowns worn along with a hood and cap proved comfortable for studying in unheated and drafty buildings and soon became a university tradition. 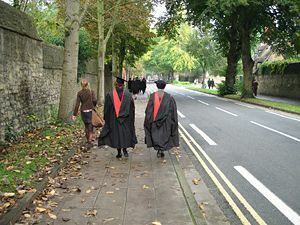 Later college colours were added to the hoods to easily distinguish one college from another (as well as promote said college) and in a single glance the gowns set students apart from the townsfolk. The university's 'uniform' also served as a subtle reminder of the student's social status as their gowns were clearly impractical for manual labour. Fast forward to 2016 and students still wear their gowns at formal evening meals and while writing exams. We were told they vote on whether or not to keep the tradition every few years. So far it remains an integral part of the Oxford University experience. 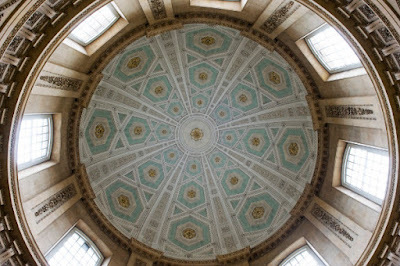 A place of higher learning since at least 1096 Oxford University is now home to 35 colleges. It's worth pointing out the university is not confined to a campus per se as the various colleges are situated here and there around town. Most allow tourists to visit on certain days of the week, depending on the students' timetable. Some charge a fee for the privilege, while others do not. Either way we found it worthwhile to venture inside if only because we're well past our college days. Click HERE for a complete list of colleges, visitation hours and the admission fees. 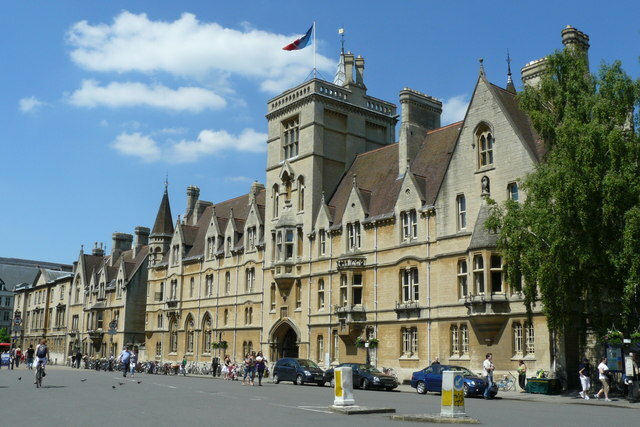 Oxford University's alma mater is impressive and includes Cardinal Thomas Wolsey (Hampton Court Palace fame), explorer Sir Walter Raleigh, architect Sir Christopher Wren, astronomer Edmund Halley (Halley's Comet), authors Oscar Wilde, Lewis Carroll, J.R.R. Tolkien, and Dorothy L. Sayers, Canada's own Lester B. Pearson, comedian and traveller Michael Palin, T.E. Lawrence (Lawrence of Arabia), Edwin Hubble (Hubble telescope), the brilliant Stephen Hawking, actor Hugh Grant, and heads of state Indira Gandhi, Bill Clinton, David Cameron and Tony Blair to name but a few. 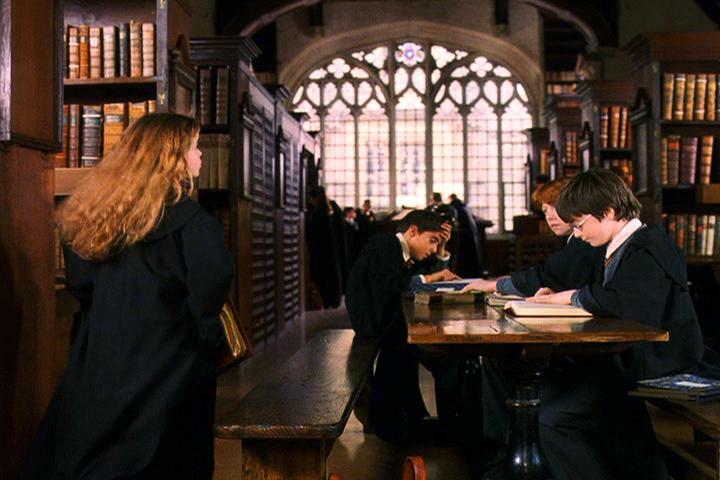 Every university needs a library and Oxford is no exception. The first library began in 1320 in a small room in the University Church of St. Mary the Virgin (below). The room still exists as a vestry and a meeting place for the church. 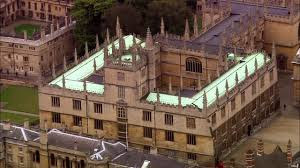 In 1444 the university decides to erect a new library over the Divinity School to house the hundreds of manuscripts donated by Humfrey, Duke of Glouchester, the youngest brother of King Henry V. The Duke Humfrey's Library is on the second floor with the huge arched window. Harry Potter fans may recognize the interior as it was featured in one of the movies. 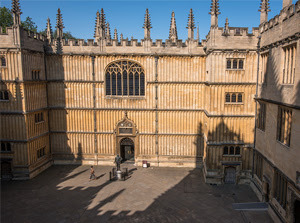 Like so many of the colleges this section of the Bodleian Library is built in a quadrangle shape, but its collections and books are housed in a number of buildings that includes the Weston Library across the street and a larger warehouse outside of the town. This is the view of the tower from inside the structure. This enormous room situated below the Duke Humfrey's Library was also the locations for the dancing lesson scene in Harry Potter. And if you're looking for an airy yet exquisite rental space it is available for weddings or other special events. Does the word "posh" come to mind?! 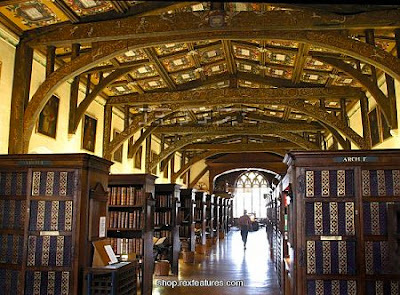 In 1598 Duke Humfrey's Library is refurbished by Thomas Bodley, a scholar, traveller and diplomat to Queen Elizabeth I. 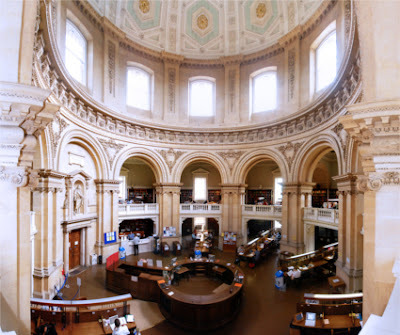 In 1602 the Bodleian Library opens and its first librarian, Thomas James, sets about to publish a catalogue that by 1620 runs to 675 pages. In 1624 the quadrangle buildings are constructed to house more books and to be used as lecture halls. The specific purpose of each room is noted in latin above the doorways. Just through that arched doorway above and within a few yards of the Bodleian is the Radcliffe Camera which also serves as a library and reading room. Built from 1737-1749 the camera (the latin word for "room") is named after Dr. John Radcliffe, the royal physician who bequeathed forty thousand GBP to the university for its construction. We were fortunate to have a look inside during our tour of the Bodleian, but we were not allowed to talk or take photos. Even our purses and backpacks had to be locked away in the Bodleian proper before we were given access. I can honestly say my first reaction was a simple WOW. Opposite the Bodleian is the Bridge of Sighs supposedly named because sighs could be heard as students walked across the bridge to write their exams - perhaps suggesting some had not studied as much as they should have! Beyond the bridge is a white house. This is where Edmond Halley (of Halley's Comet fame) lived while he was a student at Oxford. He used the white rectangular room at the top as an observatory. During our stay we took two guided walks to get oriented. The first tour focused on the university and town and we also got a great insiders view of Queen's College. Each college is a self-contained unit. Once a student enters through the large wooden doors they have little reason to leave. They live, study, eat and pray here within the confines of the college. For this reason each college has its own church built on site. The dining room at Queens College (and indeed all of the colleges) is a thing of beauty - a far cry from the cafeteria of my university days! The head table is on a raised platform to remind students these individuals are literally and figuratively 'above' and of a higher social standing. Christ Church College was founded in 1524 as Cardinal College by Cardinal Wolsey. 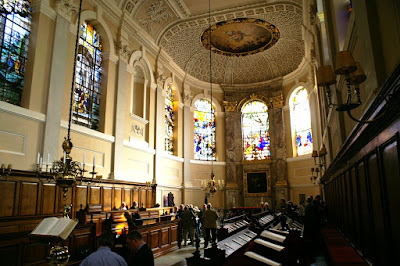 When he fell from grace, however, King Henry VIII renamed it Christ Church. Despite a rainy Sunday afternoon tourists flocked to the college and we had to cue up to be admitted. The sizeable quadrangle of Christ Church College is no doubt meant to impress. Not surprising considering its founder, Thomas Wolsey, lived in the sumptuous Hampton Court Palace. Wolsey may have founded Christ Church, but it is King Henry VII's portrait that holds centre stage in the Great Hall. Another thing that separates Christ Church from the other colleges is its cathedral (as compared to a church). This ornate enclosed viewing room (the dark carved wood) is also unusual. Perched above with a bird's eye view of the shrine dedicated to St. Frideswide it may have come in handy to prevent pilgrims or mischievous students from defacing the shrine. Other colleges include St. John's College with its massive doors...so massive it required two photos! 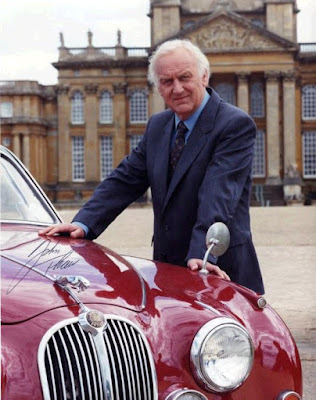 The second guided walking tour we took revolved around Oxford's streets and colleges used as backdrops to film three of our favourite mystery series: Inspector Morse, Lewis and Endeavor. It was great fun to spend a Saturday morning wandering around Oxford (often in the rain) with a group of people of all ages who shared our passion for these great television programs. If you haven't seen them on PBS or Youtube you should! One fascinating tidbit of info gleaned while on the tour concerns the actor who plays Lewis. 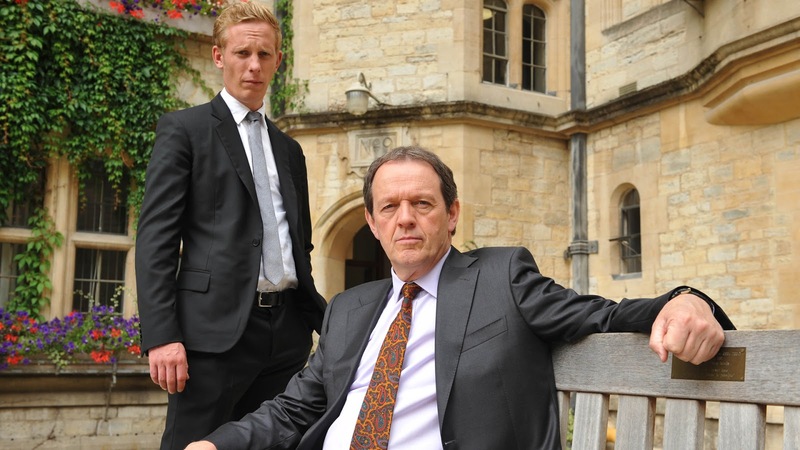 Kevin Whately was invited to lunch at Oriel College and while there was directed to a stained glass window with his surname. There he learned his ancestor, Richard Whately, had supported the college and therefore secured his place in history. Even more impressive is a number of the scenes of Lewis that were filmed at Oriel College and until that encounter the star had no idea of his family connection to it. 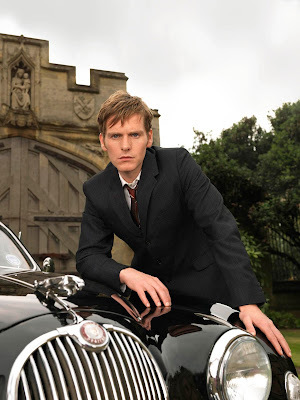 It goes without saying we did not see all 35 colleges nor were we privy to the filming of a new episode of Endeavour, but that's the thing about Oxford. One could spend an entire month here and still only have scratched the surface of its amazing history, stunning architecture and abounding cultural opportunities.